Ich erwarte eigentlich relativ wenig von The Fray, das hier liegt für mich doch ziemlich klar oberhalb des Band-Durchschnitts. Gute 4. This is really cool! I agree with the OneRepublic comparisons but it doesn't take away from the song in any way. Counting Stars for sure but it's solid. Des airs de "Counting Stars" des OneRepublic, mais ca reste un très bon single de retour pour faire suite à l'échec de "Scars & Stories". Heel wat anders dan ik van ze gewend ben, maar wel een goede plaat zeg! Zeer aangenaam verrast door deze plaat. ▒ Prima, leuke, vrolijke en swingende vier sterren plaat en voorloper van hun vierde studioalbum uit begin oktober 2013 door de Amerikaanse rock-band uit Denver, Colorado: "The Fray" ☺!!! I feel as though they haven't quite worked out what they're really pushing as a hook. But it's good to hear a Fray song with a bit of adrenaline behind it. It's a great return from The Fray! 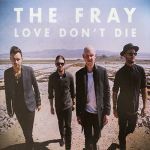 I do see similarities to Bonfire Heart and Counting Stars in this and interestingly enough they are 2 of my favourite tracks right now so in theory this should be good too but The Fray can't make it work. Awesome track and another great lead single! You can really sense the Ryan Tedder influence in this.